This entry was posted in English and tagged Kings, Old Testament, timeline. Bookmark the permalink. Mark, thanks for all these charts. I think there may be an error in the Kings of Israel, where ‘Azaziah’ after Ahab should actually be ‘Ahaziah’. And I know extra text details can detract from the visuals, but do you think there is room for a footnote informing people that some of these kings are known by different names in different parts of the OT (e.g. comparing Kings an Chronicles), just as Simon is also known as Peter in the NT? Cheers Sandy. Good pick up. I’ll have a think about how to note the differences in names on the diagram (without it being distracting). By the way, are you about to use this diagram, i.e. do you need the changes made in the near future? We are preaching through 2 Kings, so just the name correction would be good. The other is not so problematic, because most modern EVV explain the name differences in footnotes, and so it is not so hard to follow. Mark, could you also indicate what permissions I might need to supply a print out of the diagram to congregation members in the bulletin. I’d like to encourage them – especially Bible study leaders – to visit your website in future. No problems, Sandy. Please print the diagram for your congregation with my blessing. Sorry for the slow reply! Mark, also noticed that the scale of two time lines don’t quite seem to match up. E.g. Jehoram on the left and Joram on the right both finish in the same year, but their ‘blocks’ don’t overlap. Likewise, although the reigns of Jehosophat and Joram overlap (as your dates state), their ‘blocks’ don’t. I imagine that sort of thing is exceptionally hard! So not so worried about that, as the misspelling. Hello, I am a high school teacher of Biblical Studies and I found this chart very helpful and I was wondering if I might have permission to reproduce your chart as a photocopy to give to my students? It is very clear and helpful! Mark: I’d like to use this in an overhead during a guest sermon. I didn’t know if you considered that “publication” or whether you’d give permission for that type of non-commercial use. Thanks. Sure thing, Andy. Feel free to use the diagram for your sermon. All good. Mark, thanks for this chart. I am teaching an Old Testament seminary class in Thailand and am translating the chart to Thai (not for earthly profit). If this is a problem, please let me know. I will keep the copyright on the document. Thanks for letting me know, John. I’ll send you an email. Doing a personal Bible study on Isaiah, and used this as a reference for kings of Judah during the time of Isaiah! Thanks! Great to hear it, Thew. 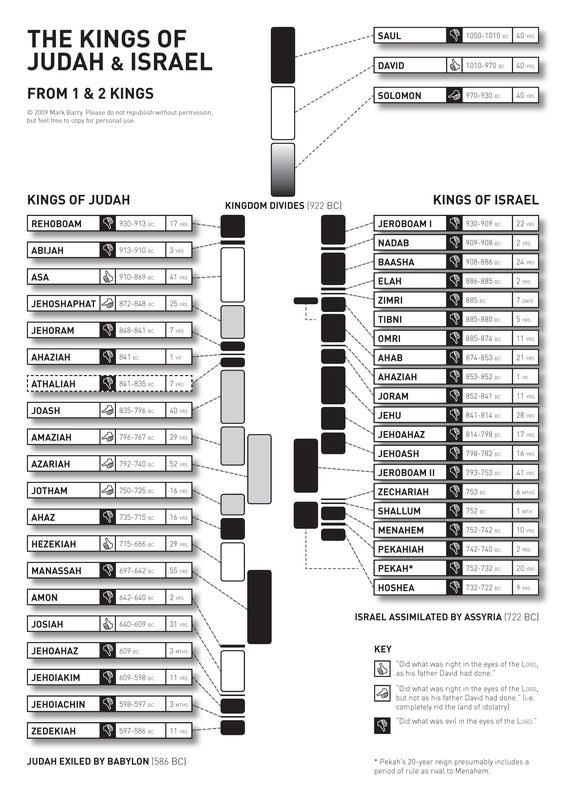 I’m ministering north of Sydney, Australia, and I have found your chart well presented and would like to reuse it to illustrate the period between the kings of Israel (I’m preaching on Amos). Would it be okay to use your chart this way? Thank you for your permission. The detail is this: I want to have your chart displayed on the screen during my preaching, and refer to it. It would be for about 15-30 seconds. I wish to point out the relationship between the two Jeroboams, and God speaking through Amos. Absolutely. Feel free to use the chart in your Bible study. If I want to use this on my blog site, how can I link back to you? Which contact information and links do you want referenced with this? If you could put this information somewhere for everyone to see it then we can easily credit you. Thanks for the kings list. Absolutely, Pastor Chris. Feel free to use the chart with my blessing. I have found this chart really helpful in my preparations whilst preaching through 1 & 2 Kings. Please can I make use of it on a future presentation that will be projected live in a service and also shown on our web site. Hi Greg. I’m not sure how well the detail of the chart will translate into a projection, but feel free to use it nevertheless. Requesting permission to post to the online course shell associated with my Bible as Literature class at a Maryland community college. Thanks a lot! My students really benefit from good visuals like the ones you are providing. Looking to have this as part of the powerpoint slides for my message on Haggai. It’s amazingly clear. Just a brief way to orient people to the journey that the Israelite people have come through. Hope that’s okay. This is for a congregation in Toronto, Canada. Thanks! Sure thing, Glendon. Feel free to use the chart. Thank you for this chart Mark. I am using it with my 3 children in our homeschool. We’ve been studying OT history and have gone through the Bible daily, now we’re in Kings. This is a very helpful chart to keep track of the Kings. Many thanks. Hi Mark. May I please use your Kings of Israel and Judah chart for a Bible study class at my church? I’m very impressed with the way you’ve arranged the chart. Thank you for considering my request. Sure thing, Chris. I’m glad it’s helpful. I am leading a Bible class on 1 and 2 Kings. Your chart is a big help. May I print out copies for the congregation as we study through these books. Absolutely, Chris. I’m glad it’s helpful for your Bible class.